Last night, when I launched the new American Airlines travel app on my iPhone to see if some credit card miles had posted, I got an alert asking me if I wanted to register for a chance to win one million AAdvantage miles. 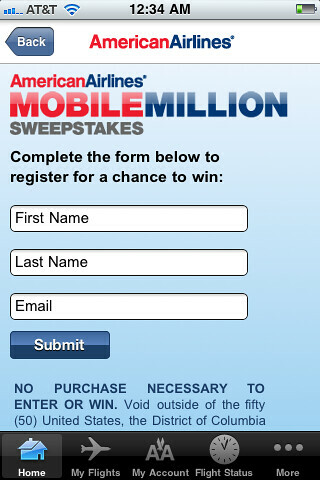 Go here to download American’s travel app and here for details about the sweepstakes. If you don’t haven an iPhone you can still enter to win. If I won a million miles, I’d probably use 330,000 miles on a first class oneworld Explorer trip (coach is only 160,000 miles). What would you do with one million miles? AirportGeek is a quiz game that tests your knowledge of IATA airport codes. You’re given the name of an airport, just provide the correct three letter code to earn points, game credits and extra time.